Their stories intersect when Steve and Mabel rob a bank in the small town where Mac has recently started working. Mac and his partner try to stop the bank robbers. Mac’s partner is killed and Mac kills Steve. Mabel draws a bead on Mac, but when they look in each others’ eyes there’s an inexplicable connection and Mabel turns and makes a getaway. The connection draws Mac and Mabel together and they both realize that there’s something fishy going on with the local cops. Mac starts asking questions around the station which doesn’t win him any friends. An unlikely romance brews. It’s hard to tell much of this story without giving the story away and discovering the story as it happens is a great part of the joy in this book. The first four chapters – which would be the first four comic issues when they were released individually – are fabulous. This is a modern noir story with a whole series of characters just trying to do their own thing and their lives intersect. Author James Robinson lays out a gritty, gripping story that keeps changing, keeping the reader on his/her toes. Tom Feister’s art really helps this story move along and he captures the modern noir look marvelously. Unfortunately, there are five chapters in this book. And any moderately literate reader will spot the ending the moment it begins. By the time I was into the third portion of this book, I was sure I was going to give this a 4.5 star rating, but the last portion is so bad that this drops down to two stars. Looking for a good book? 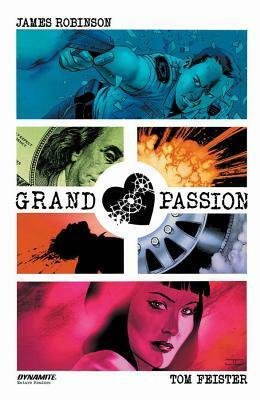 Grand Passion is a graphic novel by James Robinson and Tom Feister that really draws the reader in for a great noir story but drops the final portion so poorly that it isn’t really worth reading the story.